Low cost and high brand value - perhaps the prime draws for those opting for new entry-level models from luxury car makers. And the car makers are definitely riding the wave, in terms of pure numbers. This is why, the A- and B-Class, based on the NGCC (New Generation Compact Cars) platform, have been doing extremely well for Merc. So we can expect the CLA compact sedan that sits on similar underpinnings to make its way to India too. We'll have to wait for the launch of the 2015 C-Class for that to happen. 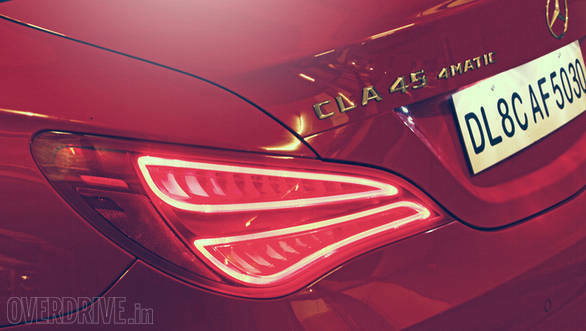 But until then, Mercedes-Benz India keeps up the anticipation with the entry of the CLA 45 AMG. The CLA is indeed a stunner  what with that CLS-inspired four-door coupe form. The AMG version goes a step ahead, adding a hunkered stance and sportier bodywork. This is an old flame, suddenly put through a makeover and pulled out, looking even more desirable than the last time you saw her. Let's walk you through the outward trappings - matte-black alloy wheels like those on the SLK 55; large wedge-shaped air intakes and scooped out air-dams like the ones on the new E 63; a splitter, a diffuser, fins on the side skirts and of course, the new AMG tailpipes. All of this is customisable even for the India-spec model. 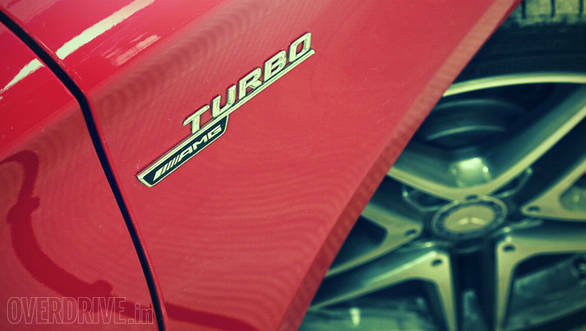 There are the customary AMG badges too, but this time, there's a new one  'turbo', calling attention to the all-new engine from Affalterbach  a 2.0-litre, inline four-cylinder turbocharged petrol. 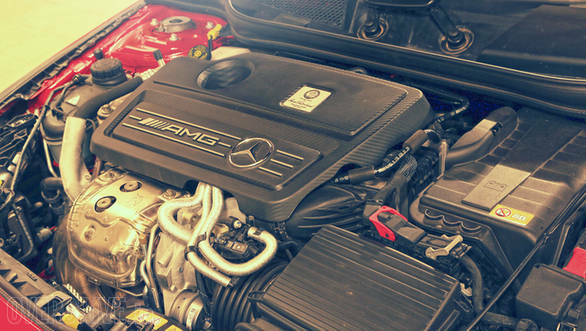 AMG's smallest engine ever, puts out 360PS and 450Nm, which coming from an AMG motor, are clearly not the kind of numbers that will make you jump out of your seat. 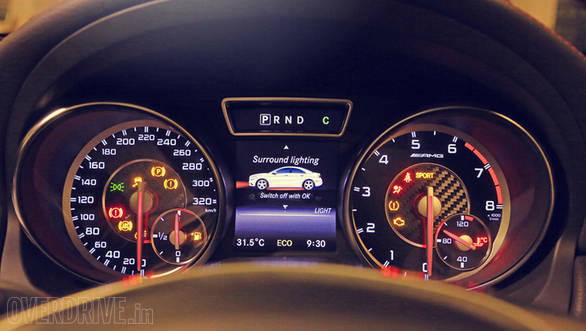 But for the tiny sedan that the CLA is, this output is claimed to be enough to take this car from naught to 100kmph in 4.6 seconds  a good 0.3s quicker than the SLK 55 AMG! But enter the real world, India to be specific and even a Race Start launch (launch control) catapulted this baby AMG to 100kmph in 5.6 seconds, a whole second slower than the claimed figure, thanks to the lower octane fuel available in the country. The CLA's stock gearbox is replaced with AMG's seven-speed dual-clutch SpeedShift sports transmission. It is quick to respond when you step on the throttle, however, on part-throttle, it tends to be slower to downshift. 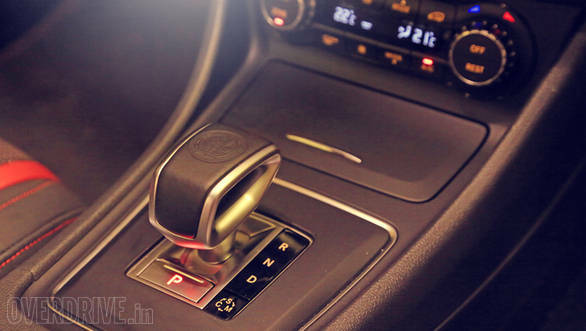 But with an AMG, you are better off using those sporty, aluminium paddle shifters. In typical AMG fashion, it matches revs when you downshift, but at the same time you'll miss the series of little explosive sounds that you get from AMGs with bigger engines. Speaking of which, this engine doesn't sound throaty like the V8 mills. Instead it sounds more like a proper four-cylinder Euro hot hatch - inside the cabin it's more muffled, good insulation to be blamed here. But what you will simply love is the wastegate whistle  which is sweet enough to give the tuner cars a run for their money.The transmission feeds all the power and torque down to the all-wheel 4Matic drive system. Predominantly, this system runs in a front-wheel drive configuration for better fuel efficiency. 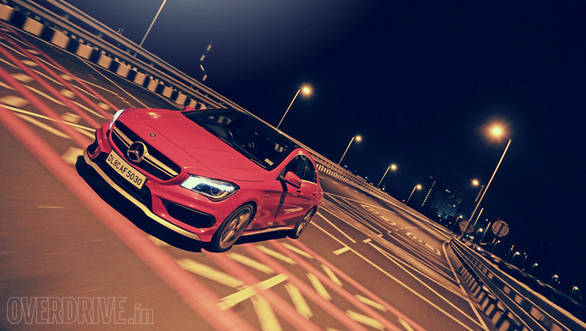 In town, the CLA returned a best figure of 8.1kmpl while on the highway, it increased to 12.4kmpl. The same transmission intervenes when you need better grip on slippery surfaces or when you want to put all the thrust down to the road, up to fifty per cent of the power and torque is sent to the rear wheels  and that is enough to get the tail wiggly if you intend to. The interiors are similar in look and feel to the A-Class, in fact I felt at home immediately since we drove an A-Class for nearly six months when the car was part of the OD garage. 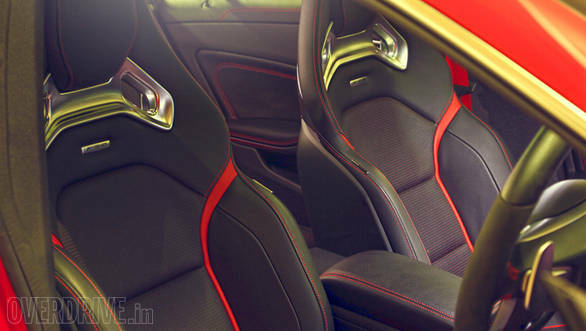 There are additional AMG bits though like a flat-bottomed steering wheel, sporty seats that have been specially developed by Recaro andAMG badging of course.The seatbelts are red in colour too and the upholstery and accent trims can be customised with options from the AMG Performance Studio. You may want to replace the clumsy plastic bits in the dashboard and centre console with carbon fibre. The car here features brushed aluminium detailing though. The plastics also tend to become noisy with time as the stiff suspension setup allows quite a bit of vibes and thuds to filter into the cabin even when you are driving in 'Comfort' mode. 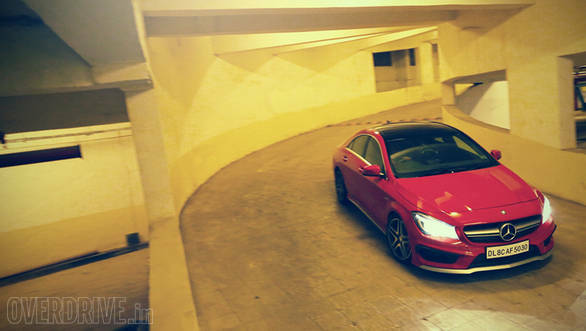 The stiffness of the suspension is responsible for the minimal body roll of the CLA 45. Ground clearance is too low for the conditions offered by Indian roads. Despite driving slowly and diagonally over a speed breaker, the under belly can come in contact, especially the rear differential. However, the vehicle has the inherent understeer of a front wheel drive system, when compared to its rear-wheel driven siblings. But that said, the CLA 45 AMG feels sure-footed through corners and makes for good driving fun. The CLA 45 AMG then is a car that looks great, has the performance to match and acoustics that are new to an AMG, but every bit as mesmerising. 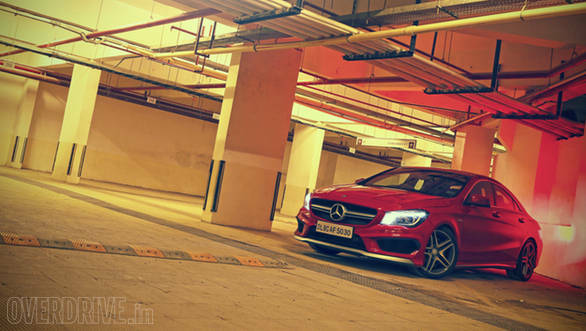 Like any other sportscar sold in India, the CLA 45 AMG's only downsides are the ride quality and ground clearance. 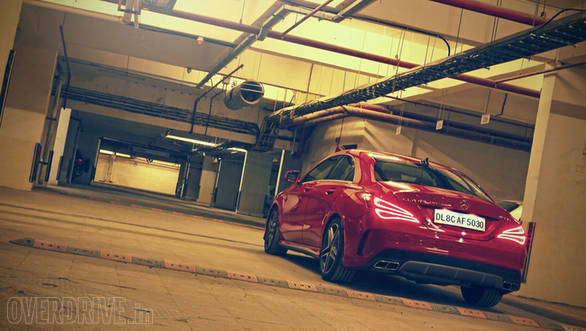 But more importantly, unlike most other exorbitantly priced sports sedans, we expect the CLA 45 AMG to be priced lower than the C 63 AMG  which itself is quite a bargain.